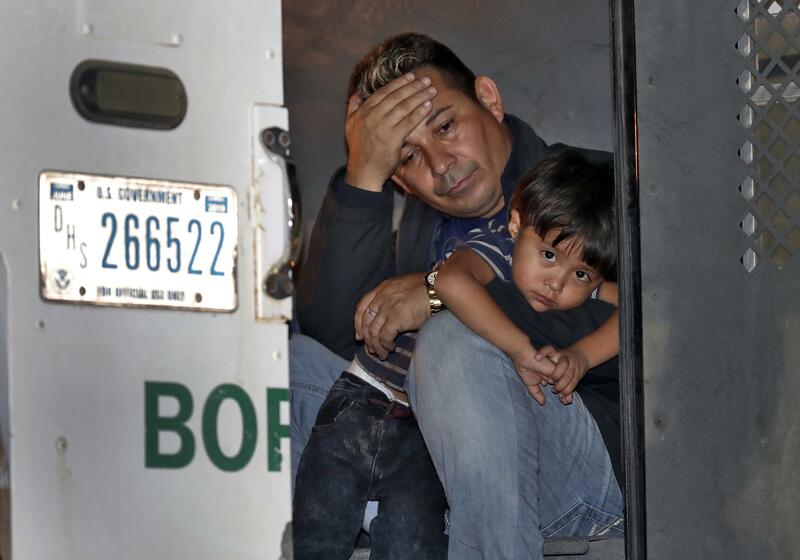 Tue., Aug. 7, 2018, 4:18 p.m.
SAN LUIS, Ariz. – The 3-year-old boy with a bowl haircut and striped shirt silently clung to his father in the back of a U.S. Border Patrol truck. The Border Patrol’s Yuma Sector has seen a more than 120 percent spike in the number of families and unaccompanied children caught at the border over the last year, surprising many in an area that had been largely quiet and calm for the past decade. Dealing with large numbers of families and children has proven to be logistically difficult for the agency. There are only so many vans to transport the immigrants to the sector’s processing facility in Yuma. Many don’t understand why so many families and children from Central America are coming to the U.S. through this stretch of Arizona and braving its extreme summer heat, when the more direct path takes them to the Rio Grande Valley in Texas, more than 1,000 miles away. Garibay said migration patterns are largely controlled by the cartels that smuggle people across. The Mexican state of Tamaulipas that borders the Rio Grande has been experiencing extreme violence by drug cartels that the head of U.S. Customs and Border Protection recently said are fighting for “every inch” of control of the river where migrants are often smuggled in Texas. Randy Capps of the Migration Policy Institute says it’s noteworthy that most of the border crossers in the Yuma sector are Guatemalans. He said it’s possible many are headed for California and that crossing through the Yuma area may be the safest and simplest way to do that. “It’s really been a combined effort across the whole agency to be able to turn this sector into something that is manageable and not somewhere there was 138,000 apprehensions back in 2005,” Garibay said. The Yuma area supplies 90 percent of the nation’s leafy greens for most of the year– a $2.5-billion-a-year industry. It’s a place heavily reliant on immigrant labor, but also where President Donald Trump beat Hillary Clinton by more than 5 points. “It’s too hard here right now,” Blanco said. Published: Aug. 7, 2018, 4:18 p.m.